Baking is not very forgiving when it comes to estimation so having a good understanding of measuring technique will yield better results in the kitchen. Always measure liquid ingredients in glass volumetric measuring cups. Likewise, measure dry ingredients in plastic or metal measuring cups or spoons (also called dry measures). These tools are typically not interchangeable. Spoon & Sweep method is ideal for dry ingredients, unless otherwise specified in the recipe. To do this, spoon the flour or cocoa powder into your measuring cup gently without patting it down and then use a straight edge, such as the blunt side of a knife, to scrape off the excess by dragging it across the surface of the measuring cup so that it is flush with the edge and the ingredient is level with the surface. Scoop & Sweep method involves drawing your measuring cup through the ingredient, such as flour or white sugar, to gather a heaped amount being generous at this stage. Then, use a straight edge to scrape off excess. This method is most often used because it is quickest but it can often lead to over-measuring by 10-30 grams. The message to take home from all of this is: do not pack it down! Never tap the measuring cup, as this causes the ingredient to settle and become more dense. The exception to these rules (there's always an exception *sigh*) is brown sugar. Most, if not all, recipes call for packed brown sugar. In this case it is important to press and pack brown sugar into the measuring cup until it is level. There are several ways to mix ingredients to form a batter or dough. Each technique contributes differently to the final texture of the baked product. Unfortunately, many recipes use mixing terms interchangeably, which may be why your brownie did not look like the super moist one in that cookbook photo! Cream - to beat an ingredient or mixture of ingredients until soft and smooth. Many recipes often require creaming of fat and sugar; this means to aerate and soften room-temperature fat (usually butter) by beating and blending it with sugar until it is smooth, light and somewhat fluffy. The sugar crystals cut through the fat globules in the butter, introducing tiny air pocket seeds that will expand further from the leavening gases produced during baking. This technique is usually used for cookies and cakes to create a light and moist texture. Beat - to mix vigorously until one ingredient, or a mixture of ingredients, become smooth and thoroughly combined. Beating is a method of mixing that incorporates air into the ingredients and usually requires an electric mixer, a whisk or a fork. Beating may also refer to vigorous manual stirring using a wooden spoon or a spatula. Stir/Blend - stirring or blending refers to a moderately gentle (but not too gentle) circular motion intended to combine ingredients evenly and create a homogeneous mixture. This can be done using a wooden spoon or rubber spatula, but not an electric device. Fold - to gently incorporate one ingredient (or mixture of ingredients) into another without stirring or beating. Folding usually involves the addition of one light, aerated mixture (whipped cream or beaten egg whites) to a more dense/moist base mixture (batter). A rubber spatula is often used to cut down through the two mixtures, sliding the spatula across the bottom of the bowl, and then turning the mixtures over one another by bringing the base mixture up from beneath the aerated one. This technique is repeated to gently combine the ingredients. It is done to retain air within the batter and create a very light product, such as angel food cake, sponge cake, soufflé or mousse. Before you bake a single thing, run out and get yourself an oven thermometer! Do it, like.....now! An oven thermometer is one of the most important tools needed for baking. Since all ovens vary slightly, especially older ovens, a thermometer is the only way to know how accurate yours is. Also, I find it very difficult to rely on my eyesight while trying to line up the little dash on the dial, unless you have a digital oven. 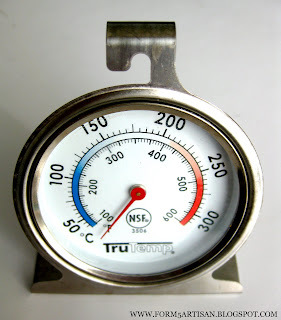 Oven temperature varies depending on the type of product and quantity of batter or dough. Generally, if the temperature is too low during baking, the product may not rise properly or dry out by the time it is cooked. If the temperature is too high, the product may brown too quickly, form a hard crust and have an undercooked interior with an overcooked exterior. Cakes baked in 8 or 9-inch pans usually use 350°F, which allows for even rising and cooking without over-browning. Larger cakes that are more than 10 inches in diameter, and even some recipes for 9-inch cakes, use 325°F due to the large quantity of batter required to achieve the same height as an 8-inch cake. If baked at 350°F, the resulting cake will brown before it has time to cook in the center. Quick breads, such as muffins, scones and biscuits, typically have higher baking temperatures between 375 and 425°F because they contain a high amount of leavening agent. The high temperature encourages rapid rising by quickly activating chemical leaveners and increasing the reaction speed to produce a light and flakey texture. As long as the baking time is followed properly, the product will not be undercooked since these types of doughs are not as wet as cake batters. Pies normally use two different cooking temperatures. First, pies are baked at a high temperature between 400 and 450°F in order to seal and cook the crust. This helps to prevent the base from being soggy and also helps to prevent leakage of fruit juices through the seams. Then, the temperature is reduced to about 350°F in order to evenly cook the fruit filling without burning the crust. Most cookies bake at 350°F and are usually under-baked intentionally to produce a nice brown crust with a chewy and soft center. Higher temperatures are used to make drier and crispier cookies, while lower temperatures are used to make softer cookies with less browning.